Beat cream cheese, sugar, and peanut butter in large bowl with mixer until blended. Gently stir in whipped topping until blended. Spoon into crust; drizzle with fudge topping. Swirl gently with knife. Refrigerate 4 hours or until firm. Refrigerate leftovers. Seriously. How easy is THAT? So meanwhile, Rae’s fussing and we’re passing her back and forth in efforts to get her to stop. Cam wants me to smooth out the filling into the pie so I hand Rae to him and begin smoothing the pie. Cameron reaches over and takes a dollop of filling to give to Rachael. She should like it, right? Peanut butter, sugar, whipped topping – what’s there not to like? She does NOT like it. It touches her tongue, she makes a funny face, and swallows. He tries again, and the child TURNS AWAY FROM PEANUT BUTTER PIE FILLING. What is wrong with her? Meanwhile, I’ve smoothed the pie and it’s ready for the drizzling. I heat up the chocolate just enough to make it more liquid and Rae is starting to make her hungry noise. She flicks her tongue over her lips repeatedly growling “blelem-blelem” as she goes. We both looked at her and laughed – so I used one of her baby spoons to stir the sauce… she went NUTS, she’s openly drooling now! I handed the semi-scraped off spoon to Cam and he gave it her and put her on the ground. 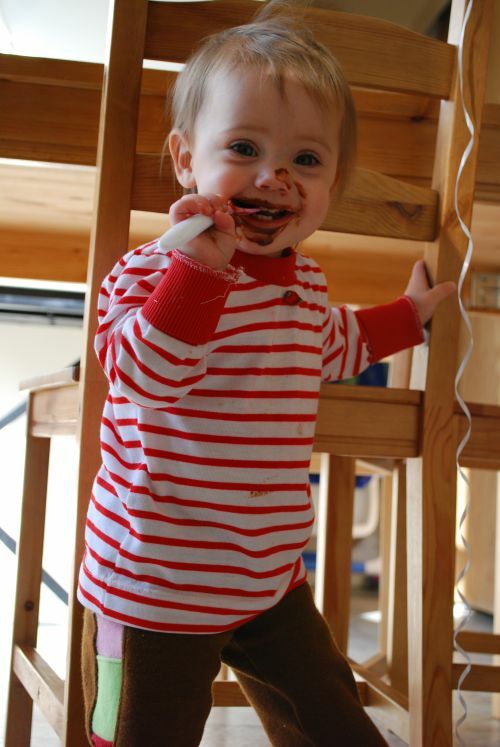 While the world knows my opinion on chocolate, it’s become clear that my baby does not agree with me. I have never seen a baby so content.